It's just a few hours until Thanksgiving and that means we're only about a day away from the official time to trim the tree and deck the halls. It can be stressful but it doesn't have to be. Take a little advice from Lynn Masters, our gift buyer, designer and merchandiser. As much as we try, we can't buy Christmas. Holidays are best celebrated when they're about the experience. That's why DIY projects make decorating your home for the holidays fun rather than a chore. Star-shaped flowers grew wild along the streets of a small town in Mexico. Despite their natural beauty, poinsettias were considered weeds since they were so plentiful. That was, until one little girl made them history. It's time for thanks and time for giving. So while we're busy stocking our shelves for all of your holiday wants, we're also making space for the basic needs of one of our favorite nonprofits–The Green Chair Project. Mistletoe is scientifically categorized as a parasite. So why did the kissing tradition begin? What made this parasitic and poisonous plant so alluring for lovers? Accent bows. They are the focal point of the wreaths on our front doors. They’re at the tops of our Christmas trees and grace all of our windows with perfect symmetry. They seem so elegant in their simplicity. And they are simple. Holiday accent bows can be just as easy to create as they are easy on the eye. Can you tie them in a knot? Then you can tie them in a bow. It’s That Time: Poinsettias are Here! Poinsettias: few other flowers are as synonymous with Christmas as this one! This plant was brought to the United States from Mexico in the 1828 by Joel Roberts Poinsett. In Mexico, this plant is a perennial shrub and can grow 10-15 feet tall. The part of poinsettias which most people think of as the flowers are actually colored bracts, or modified leaves. The flowers are the center of the bracts. To get the longest-lasting poinsettias, choose plants with little or no yellow pollen showing because the plant drops its bracts and leaves soon after losing their pollen. While poinsettias have long been rumored to be poisonous, this is not true. Ingesting the leaves of this plant will cause a child or pet to be sick with an upset stomach, vomiting and nausea, and they would have to eat 500 to 600 leaves to experience those side effects (and the leaves are not tasty). Despite that, it’s still best to be cautious about where you place house plants with pets and children in mind. There are over 100 varieties of poinsettias on the market, ranging from red to pink, white, and purple. The red variety is the most popular and traditional. Although most poinsettias sold in the US come from California and their sales contribute over $250 million to our economy, our Poinsettias are grown locally. They are the bestselling potted plant in the US, which most being sold in the six weeks leading up to Christmas. When bringing poinsettias home, make sure to place them poinsettias near sunny windows, or somewhere where they will receive plenty of sunshine. Be careful not to let the leaves of the plant press against the cold window panes, as they are tropical plants that dislike cold. They do not do well with very hot or cold drafts, so take care to keep them away from air registers and open windows or doors. Water only when soil feels dry and when watering, ensure that water soaks the soil down to the bottom of the pot, and then discard any excess water. If you plan on keeping your plant for several months, apply a soluble houseplant fertilizer for best results. It is possible to keep your poinsettia going for longer than the Christmas season. You will need to care for it as you would any houseplant, and probably cut back the old flowering stems in February or March to maintain a good shape. Continue to fertilize the plant as needed. For those who just want holiday blooms, take advantage of our “Dead or Alive” Program. Save the “Dead or Alive” tag and bring it back in the new year for a $5.00 discount on any house plant. 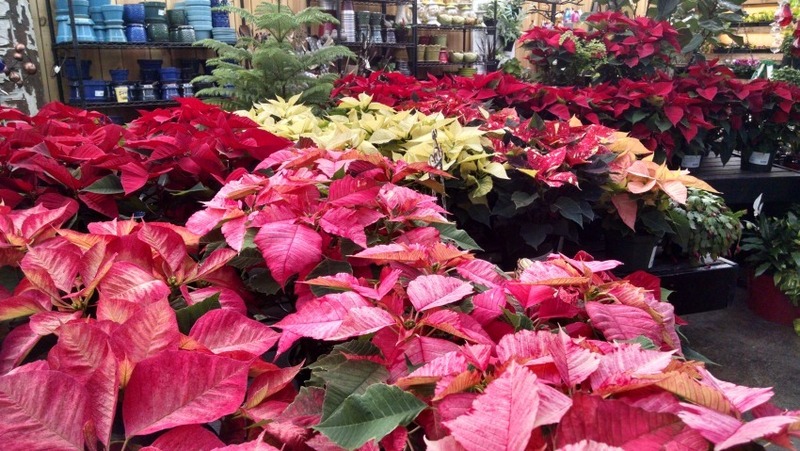 Our beautiful stock of Poinsettias is ready and waiting for you, so stop by and see us! Our knowledgeable staff can help you with any questions you have about caring for these festive flowers! Hello everyone! Hope you are all having a wonderful weekend and are enjoying the burst of wonderful weather we've had to officially welcome in spring. We've had a great time this weekend at Garden Supply as we wrapped up our big week-long Spring Garden Party yesterday. Thank you to everyone who participated and to everyone who stopped by and helped make our annual party a huge success! We couldn't have done it without you! Now that spring is truly here, it's time to turn your thoughts to a bit of yard prep and lawn care. If you haven't yet done so, now is the time for fertilizing fescue grass. Some lawn fertilizers contain pre-emergent crabgrass killers, which should go down within the next 10 days. We recommend you use Fertilome Crabgrass Preventer Plus Lawn Food. Use Fertilome Classic Lawn Food if you have already applied crabgrass preventer. We've got everything you need down at the garden center. While over-seeding should wait until mid-September, you could work on seeding small, bare spots now. This will require careful attention to watering in dry weeks, especially as we get into summer. Cool weather weeds, especially chickweed, which blooms with a small white daisy, are gaining maturity now. It's easy to get them by pulling the clumps by hand or by hoe. It is blooming already, so it's a good time to get out as much as you can before the seeds go flying. Come talk to our gardening experts for solutions. With Easter being two weeks from today, now is the time to stop by the Greenhouse and check out our adorable holiday decor. We have a huge selection of beautiful and unique items to spruce up your homes and decorate your tables for the season. And look what else I discovered while strolling the Greenhouse yesterday afternoon. A sale! Always love a sale! This lovely selection of pottery is now 30% off! Just think of all the plant arrangements you could make for your decks and front porches with these. Or thinking ahead, what wonderful Mother's Day presents these would make filled with flowering blossoms. Thanks so much for stopping by! We'll see you back here soon for more snippets from the garden!